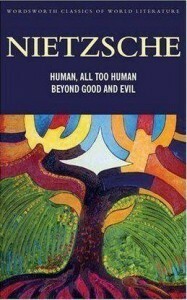 Human, All Too Human subtitled A Book for Free Spirits was originally published in 1878. A second part, Assorted Opinions, and Maxims (Vermischte Meinungen und Sprüche), was published in 1879, and a third part, The Wanderer and his Shadow (Der Wanderer und sein Schatten), followed in 1880. Reflecting an admiration of Voltaire as a free thinker, but also a break in his friendship with composer Richard Wagner two years earlier, Nietzsche dedicated the original 1878 edition “to the memory of Voltaire on the celebration of the anniversary of his death, May 30, 1778.” Instead of a preface, the first part originally included a quotation from Descartes’ Discourse on the Method. Nietzsche later republished all three parts as a two-volume edition in 1886, adding a preface to each volume, and removing the Descartes quote as well as the dedication to Voltaire. Reflecting an admiration of Voltaire as a free thinker, but also a break in his friendship with composer Richard Wagner two years earlier, Nietzsche dedicated the original 1878 edition “to the memory of Voltaire.